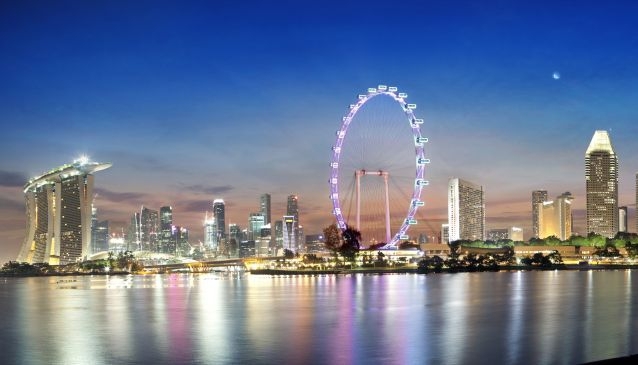 At a soaring height of 165 metres, Singapore Flyer is the world's second largest giant observation wheel after Las Vegas' High Roller (167 metres or 550 feet) and one of the biggest tourist attractions in Asia. Since its launch in 2008, it is a must-see for all visitors, and an ideal and relaxing way to get an overview of the island. Each scenic flight on board the Flyer guarantees a stunning panoramic view of the Marina Bay's skyline and the surrounding islands to the south. It is also a favorite spot during the Formula One Grand Prix race circuit. The Singapore Flyer offers lunch, high-tea, dinner and cocktails on its flights, which is one of the most romantic things to do on the island. The first full-butler sky dining will certainly impress. Make sure you book ahead of time to secure your table. Several restaurants, shops and activities such as a fish spa can be found here too as well as an authentic 1960s-themed food street, the Singapore Food Trail and a charming garden with ponds, waterfalls and lush greenery which sets the Flyer's centre-piece. Be greeted by exclusivity and style as you enter the Flyer Lounge, offering an extensive list of cocktails, such as the award-winning Lady's Dream or a perfected Singapore Sling. The ambiance continues with soft piped music, delightful light snacks and friendly service. From the terrace, enjoy a fantastic view of the new Gardens by the Bay just opposite. With activities, shopping and dining to accommodate the breathtaking views, the Singapore Flyer is sure to satisfy all of your senses.